When we got a Baby Bullet for Christmas, I was super stoked about the premise of making fresh baby food instead of buying the jarred stuff. 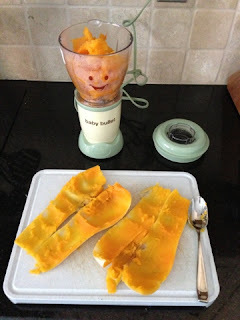 How wonderful to save all that money, and maximize the nutrients my baby would be eating! But it was still a hypothetical back then. 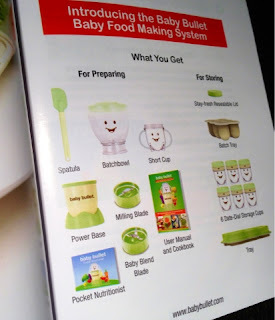 I knew from others that you could do basically the same thing with the internet, a blender, a food processor and various storage containers; but I liked the idea of having a system that only touches baby food. And who can resist the smiley faces on the side of all the gear! 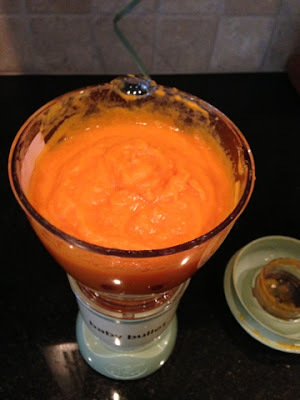 When Penny hit 6 months, she was showing all kinds of signs that she was ready for solids, so, last time I was at Sprouts Marketplace, I bought a giant organic sweet potato, and set aside some time to bust out the bullet and make us some baby food! Let me preface my experience with this: I don't really cook. I bake, I heat things up, and I assemble salads and sandwiches, but that is pretty much the extent of it. So... I literally had to look up on the Internet how to steam vegetables. Oh that's what that pot with the holes is for... Needless to say, if I was to have success using a baby food maker, it had better be a simple one. I read the whole manual and then found the sweet potato page. I really liked having all the information about what foods and how and when to give then to your baby, plus (dummy-proof) recipes to make pretty much any baby food, all in one book. I peeled. I steamed. I cubed. I added water. I bulleted. I portioned. and I stored. It was pretty simple. 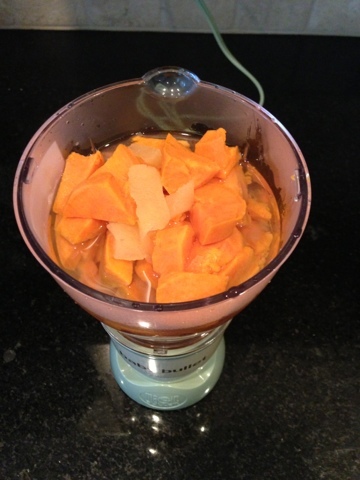 One sweet potato filled all 12 of the single-serving compartments: 6 lidded jars and the 6-serving freezer container. Instead of steaming, I baked it (cleaned, halfed, meat side down in two inches of water at 400 degrees for 40 minutes). I had never done this before. But it worked. 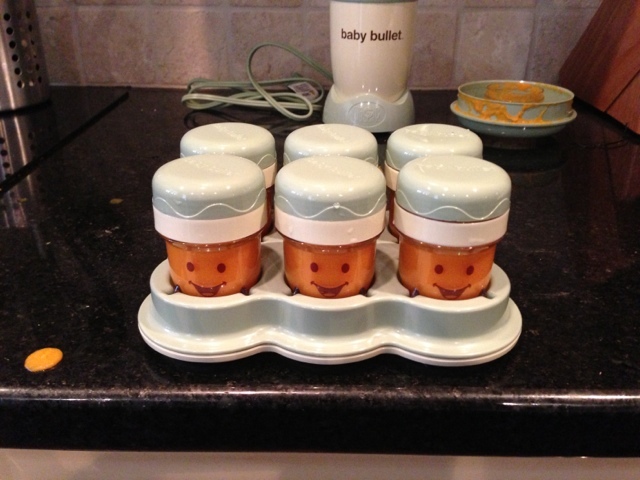 Then, I spooned the softened squash meat into the bullet, added water, and voila: 8 servings of baby food. 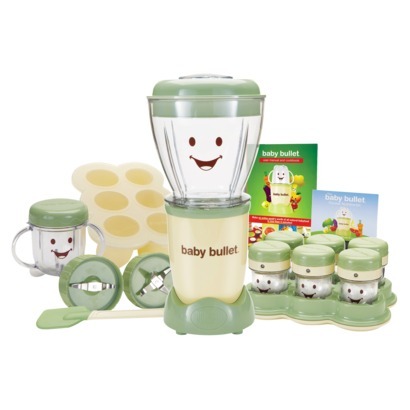 *I should note that the Baby Bullet comes with a blending blade, and a milling blade (for oats and cereals and stuff). I made both these veggies with the blending blade. I have yet to use the milling blade but plan to soon! Short supply. I would have it come with two freezer trays and two sets of 6 jars. One of each is not enough if you are trying to make a bunch of food on one day to last you a couple weeks. I am going to see how much $$ it would cost to order extra batch tray and storage cups online (if you even can). If the price is ridiculous, I will probably buy some generic tiny re-usable freezer containers. Pouring struggles. The spout on the blender container is pretty worthless for pouring -- it inevitably spilled off the side when I was trying to put the puree in the containers and I ended up having to spoon it in. The spatula included is not as effective as they say it will be in the instructions. They should modify it to have a larger spout, or include a little cheap funnel. 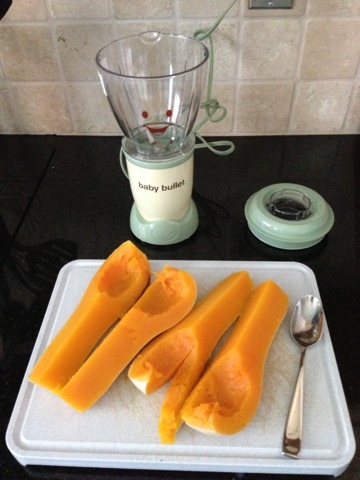 I have this same problem with regular blenders too... but thought it worth mentioning. Easy to clean. The thought of having to assemble, disassemble and clean my big clunky blender (or food processor) every time I wanted to puree something would discourage me from doing it. The "batchbowl" set up is like a mini blender, no clunkiness, no huge heavy parts. It's super convenient. It even has a smaller blending cup (the "short cup") for if you just want to puree one apple, etc. The storage. I like that the storage containers are all one serving size. I like that they can be both refrigerated or frozen. and I LOVE that they have a little turn thingee on them to help you remember what date you made the food (so you don't have to write on them, or use tape like I would have if I used other containers). It's not obnoxiously loud. I mean, it's got a motor, and it purees things in ten seconds... so there is some noise. But it's way quieter than my blender and food processor. I was actually wearing my baby when I made the sweet potatoes, and she didn't even flinch while they were blending. She was asleep in the next room when I made the squash, and she didn't wake up. The book that comes with. It's a great resource and it's written in a very dummy-friendly way. I so appreciated this, since I'm a little bit of a dummy in the kitchen. We got this as a gift, but I looked it up and it retails for just under $60. I think $60 is a completely reasonable price for this item. If you were going to buy a cheap (maybe even used) blender, a cheap food processor, 12 freezable/reusable small containers, and a worthwhile baby-food recipe book, you would probably spend more than that. 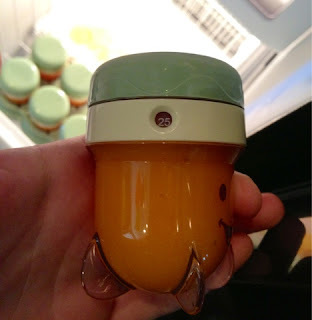 I mentioned above that while one could get by using already-owned kitchen appliances, I prefer using this smaller device over our big hefty appliances for these little baby food portions. All in all, I think it's a great product. We just ordered food maker for our precious little dolly and she loves that! I loved Baby Got Stuff work and I am calling them next time as well! Recommended to all! One of my favorite place to eat out or eat in. It's my go-to when I do not wish to cook and don't what I'm craving. It always falls in the spot. I'm all about curry and crispy chicken. Loved the food here! The ambiance was good and we got service quickly. Liked the spiciness in the curry dish and liked to try new menu items. I would defiantly go here again!